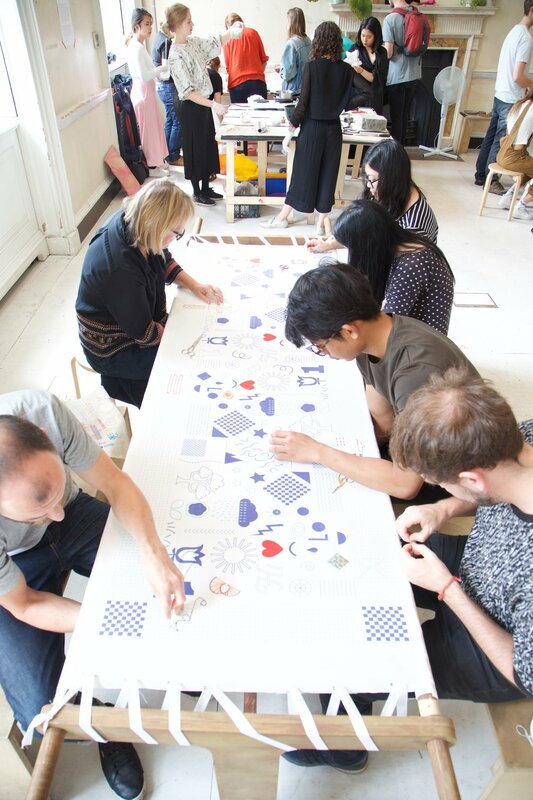 Stitch School are pleased to facilitate embroidery events based around the large 3 meter embroidery table. These events are called ‘The Supper Cloth’ providing a space for people to sit down, slow down and feed their creativity through stitching and co-creating a communal Supper Cloth in wonderful environments. Participants explore the wealth of embroidery stitches, learn together and create a communal supper cloth to celebrate the art of needlework. Discovering the benefits of stitching as a form of de-stressing, which encourages making as an antidote to modern life and a creating a sense of well being and relaxation. The Brixton Supper Cloth 170cm x 80cm Natural linen, community embroidery cloth for Brixton Town Hall, funded by Cultural Seeds, GLA - over 100 participants 280 hours of stitching over seven days.